Dozens of cases of children who died of abuse and neglect in Massachusetts over the last six years remain unresolved, the alleged abusers unpunished, because state investigations have been hamstrung by long delays in determining whether deaths were accidental or criminal, and the frequent inability to determine exactly how children died, the New England Center for Investigative Reporting has found. The state medical examiner’s office, long under fire for delays in performing adult autopsies, is even slower when children die, taking an average of 242 days to find an official cause of death in abuse and neglect cases. Official death reports based on those findings sometimes take more than three years to complete, NECIR found in its review of 102 cases, including the case of a 1-month old boy who died in 2012 whose death determination is still pending. The unresolved cases include several open homicide investigations, but also many others in which the medical examiner was unable to confirm whether wrongdoing was at play. In more than 40 percent of the cases reviewed, the medical examiner could not determine if the child’s death was an accident or a deliberate act. As a series of high-profile child abuse deaths in Massachusetts make headlines – including the recent arraignment of the alleged killer of 2-year-old Bella Bond whose body was found in a trash bag on Deer Island – family members of children whose abuse drew less public notice question if justice will ever be served in their cases. “We have been trying so hard to find out what happened. This has been going on for two years,’’ said Sharon Crawford of Whitinsville, who says her daughter called the medical examiner repeatedly, sometimes several times a day, for news about the 2013 case of her 10-year-old son, Isaiah Buckner, whose death had been linked by social workers to abuse and neglect. State officials acknowledge that the medical examiner’s office has been plaguplagued by delays, and is currently facing a backlog of 1,922 pending autopsy reports from 2011 to 2014. Daniel Bennett, secretary of the Executive Office of Public Safety and Security, said the office is trying to hire more examiners and other staff to reduce the backlog. Still, even with sufficient resources, the process is necessarily painstaking and slow in some cases, Bennett said. Infant deaths, for instance, sometimes require multiple scientific tests and the review of reports from law enforcement, the state Department of Children and Families and hospitals. When young children die, there are often few clues about the cause. Unlike adults or older children, they generally leave no trail of evidence such as text messages, no a wide circle of adults who might have noticed or suspected signs of abuse, and little verbal capacity to tell anyone about their plight before death. Children also are often in the care of more than one person in the period leading up to their deaths, making it harder to identify a suspect. Beyond the heartbreak for families, the delays and uncertainty in these cases may also be putting other children at risk, say child advocates. Stephen C. Boos, medical director for the Family Advocacy Center at Baystate Children’s Hospital in Springfield said long delays can hurt investigations, potentially allowing killers to escape responsibility. 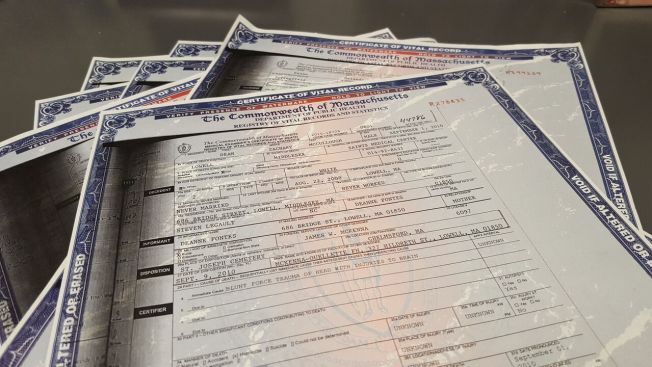 Police records show that UMass Memorial Medical Center hospital initially linked Jay’s death to Sudden Infant Death Syndrome – but Medeiros hounded authorities to look more closely. Eighteen months later, in May 2014, her worst fear was confirmed: The Office of the Chief Medical Examiner ruled Jay’s death a homicide caused by “blunt trauma” to the head and neck, inflicted by others. Now, three years after Jay’s death, no one has been charged, and the investigation remains open. Jay’s parents were with the baby when he stopped breathing, police records show. They cut ties with Medeiros shortly after the child’s death and moved out of state. The couple, who have a new baby boy, declined to answer questions about Jay when a reporter visited last spring or left several phone calls and text messages over the last six months. In 45 of the 102 child maltreatment fatalities reviewed by NECIR, medical examiners could not determine the manner of death – meaning they couldn’t decide between two or more causes, including whether a child died of an accident, homicide, suicide or natural events. The majority involve what DCF calls “unsafe sleep” deaths linked to parents who shared a bed or put babies to sleep on their bellies, actions said to put children at higher safety risk. Other deaths involve children who ingested sleeping pills, were drowned or were injured. William Fitzpatrick, president of the National District Attorneys Association, based in Alexandria, Va., said that there isn’t a national database to examine what happens to children whose homicides go unprosecuted. However, he is certain that more children are victims of homicide than data suggests. With a sudden infant death, for example, a child could have accidentally suffocated, he said, but there are often not enough clues to confirm that. Even when there’s evidence of wrongdoing, he said, prosecutors don’t always know who did it – particularly if two parents were present. When Massachusetts’ child deaths are ruled homicides, police do a pretty good job of closing cases, records show. According to criminologist James Alan Fox of Northeastern University, state police solve 90 percent of homicides involving children under 11 years old, a much higher clearance rate than for murder cases involving older children and adults, according to an analysis of 2000 to 2013 data he carried out for NECIR. Even in the notorious case of Fitchburg preschooler Jeremiah Oliver – who went missing while under state social service supervision -- no cause of death has yet been announced almost two years after his body was found. Jeremiah’s mother and boyfriend, already charged with assault, kidnapping, and child endangerment, could face murder charges if the medical examiner rules the case a homicide. In some cases, even a finding of homicide does not prompt action. The medical examiner ruled that 1-year-old Keanu Ramos of Pittsfield died of “blunt trauma” in February 2010 and the Berkshire County District Attorney’s office confirmed the investigation is still open almost six years later. But Keanu’s family said they were never even informed that the child allegedly was a victim of homicide. “You have shocked me,” said his great-grandmother, Sandra Mills, when a New England Center reporter informed her earlier this year. She later told her family what she learned and reported back, that they believe his death was natural: “None of us believe it,” she said about the state report. Felix Browne, a spokesman for the state office of public safety, said medical examiners are supposed to notify district attorneys and DCF when a death is ruled a homicide. He would not comment on the Ramos case. Family members also are waiting for answers in the case of 2-year-old Dean McCullough of Lowell, whose 2010 death was ruled a homicide seven months after his passing, caused by “blunt force trauma of head with injuries to brain,” according to his death certificate. McCullough had an open DCF case at the time of his death and the state child protection agency later determined that his death was linked to abuse and neglect, records show. Medeiros said she called DCF multiple times to warn that Jay was at risk after she quarreled with her daughter, who moved out of her North Attleboro home in September 2012. Two months later, in November, police were called to Richmond Avenue following a 911 call that a baby wasn’t breathing, police records show. The child’s mother met them at the front door and sent them upstairs, where his father was giving Jay CPR, police reported. Medeiros said she repeatedly called police to investigate and the medical examiner for a death ruling. She believes the couple left after police obtained search warrants to investigate his death two months later. The young couple may have wanted to move on, but their past followed them as they settled into a second-floor apartment on a residential street in Lakewood, Ohio. Last spring, a New England Center reporter knocked on the couple’s shuttered apartment and left a letter requesting comment when nobody answered. Jay’s father declined to comment. She said the District Attorney’s office provides no information. A local police officer has told her privately that without more information, the investigation is stalled. She worries incessantly about Jay’s little brother, now nearly two years old. The New England Center for Investigative Reporting is an independent, nonprofit news outlet based at Boston University and at the studios of WGBH News (NPR/PBS) in Boston. NECIR interns Shan Wang, Bianca Padró Ocasio, Weiwen Zhao, as well as Todd Wallack of the Globe staff contributed research to this project. Jenifer McKim can be reached at jmckim@bu.edu.